When Lil had invited Harry for tea. Piling the treats up in teetering towers. …and a foggy March day, round about three, when Lil had invited Harry for tea. This is one of Faber and Faber's first picture books for the under-5s and I'm sure it will be well received by parents and young children alike. 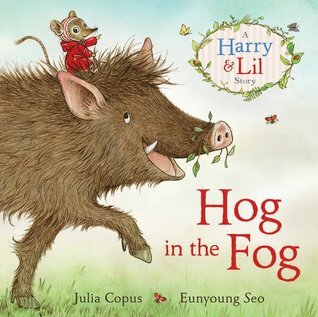 It tells the story of Harry the Hog and his friend Lil who goes looking for him when he fails to turn up for tea. She's helped in her search by a sheep, a deer and a crow, but the thick fog makes their quest difficult. Needless to say, there's a happy ending with everyone sharing a party tea at the end. The book has a Julia-Donaldson-style rhyming text that works brilliantly for young children, and Eunyoung Seo's illustrations bring it beautifully to life. I particularly like the surprising details such as the butterflies that follow the flowers wrapped around the deer's antlers, and Crow's bottle cap hat. Even better are the pages that show the fog thickening, but there is plenty to talk about in all the pictures. The front cover calls the book 'A Harry & Lil Story' so I'm assuming that this is the first in a series about the two friends. I can't wait for the next one! It's a lovely book. Don't miss it!